The development of technology can not be denied causing significant excesses in the world of education. The shift of the learning method from the face-to-face learning model directly in the classroom to the online learning system through internet technology is one of the excesses. This kind of learning system is able to reach locations that are difficult to reach as long as there is internet connection. Boundaries become meaningless with this online learning system. Currently, many workers who want to continue their education to improve their competence and of course want to earn better. However, they are constrained by time constraints due to heavy work schedules and difficulty reaching the college venue. Not to mention the condition of congestion in big cities increasingly complicate the step toward the campus. This is what underlies the emergence of distance education and internet-based so-called college/ online courses. In addition, the number of internet users today is very much. The current internet speed is getting higher, making it easier for access to online college. This certainly makes the realization of online college more real. Offline campus requires the provision of classrooms, buildings, and a series of physical learning media that require substantial funds. Good for procurement and maintenance. This of course becomes a problem for the average worker who becomes the backbone of the family. Various obstacles faced by workers to improve soft skill is moving the various parties to hold online college. First, Learning is done online. All interactions, either interactions between students or with tutors are done online through the internet network by using media or email-based sites. Second, Demands awareness of every participant online learning program for self-discipline and active learning. This is a very important thing in the online learning system. Third, Learning materials and reference materials are available in various formats. Usually available in text format in the form of PDF files, in the form of video, and also in audio form. All materials can be accessed by the participants in accordance with the instructions and procedures of the organizer. Fourth, The assessment is done online. Participants are usually given a task once a week or every day and then assignments are sent to tutors or instructors. Tasks that have been uploaded will be assessed by the tutor in question. The value of this task is an indicator of the success of participants in the online college programs. Fifth, There is a discussion forum between participants. In the online college class, forums are generally provided as a place for discussion among participants. Usually there is a public forum and there is a special forum. Special forums are used for discussion among participants in a group. Because usually one class is subdivided into several groups. While general forums are used to convey the results of the discussion of each group in a special forum. In public forums each group can argue with each other and criticize other groups. 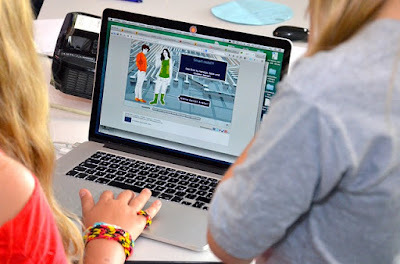 Online education is a social activity that seeks human beings to develop their knowledge and skills by using internet (connectivity) as media and mainstream media. Online educational content is an arbitrary teaching and learning aimed at training students / students / communities (users) more independently and responsibly. Content distribution for cognitive, affective and online psychomotor domains of education is not standardized by institutions, but is dependent on the source of the teacher (uploader). Thus, online education is more widespread than formal schooling.